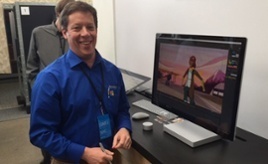 At the launch event for Microsoft’s new Surface Studio, Smith Micro showcased enhancements to its award-winning 2D animation software, Moho™ 12 (formerly Anime Studio®). The latest release includes new features optimized to work with Microsoft’s groundbreaking new Surface Dial, which makes it faster and easier to create complex animations. Moho features enabled for Microsoft's Surface Studio and Surface Dial include a new overlay timeline that allows artists to intuitively navigate in time and animate using the entire screen, enhancements to rigged character functionality using Moho’s Smartbones feature, a rotating canvas feature that enables artists to change canvas orientation by simply turning the Surface Dial left or right, and efficient frame-by-frame sequencing and animation play-back. “Moho 12 is already the most complete drawing and animation solution on the market. Now with the power of the new Microsoft Surface Studio, and the ease and creativity afforded by the new Surface Dial, Moho turns the tedious work of traditional animation into a faster, more streamlined digital experience," said Fahim Niaz, Director of Product Management at Smith Micro Software. Please note that Moho 12 can be used with previous versions of Microsoft's Surface devices, but the new features developed specifically for use with the Surface Dial will only be available on the new Surface Studio. The new functionality enabled by the Surface Studio and Surface Dial complement existing Moho 12 features such as enhanced freehand drawing tools, customizable vector Bézier handles, smart warp and Smart Bones™ animation functionality, and much more. Users can purchase the enhanced version of Moho 12 from Microsoft’s on-line store beginning in November 2016 in coordination with the commercial release of the new Surface Studio and Surface Dial. Alternatively, the enhanced edition of Moho 12 is available for purchase in advance of the Surface Studio's availability on Smith Micro’s online store. To learn more about Moho 12 running on the new Microsoft Surface Studio PC, click here.